The Executive Summary presents key topline findings from the Justice Gap study. Click here to view the executive summary of the Justice Gap Report. 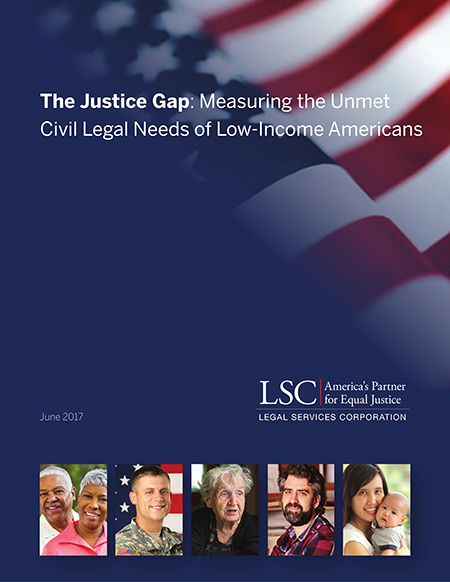 The Justice Gap: Measuring the Unmet Civil Legal Needs of Low-income Americans explores the extent of the justice gap in 2017, describing the volume of civil legal needs faced by low-income Americans, assessing the extent to which they seek and receive help, and measuring the size of the gap between their civil legal needs and the resources available to address these needs. Click here to view the Justice Gap Report. Explore the extent of the justice gap for special populations of low-income Americans. In 2005 and 2009, LSC published studies measuring the justice gap which found that about 50% of people who approached LSC-funded legal aid organizations for help did not receive it because the organizations had insufficient resources to take on their cases. The 2017 Justice Gap project is more ambitious. 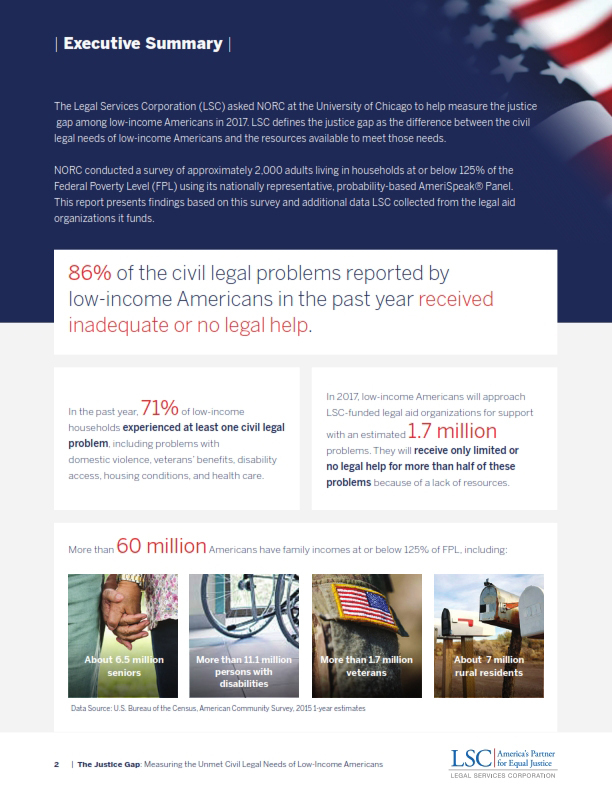 In addition to providing updated information on people seeking help from LSC-funded organizations who are turned away, the 2017 project seeks to answer questions relating to the civil legal needs experienced by low-income Americans who do not seek professional legal help and the paths they take when facing a civil legal problem (with or without the help of LSC-funded legal aid organizations). A central part of the project is the 2017 Justice Gap Measurement Survey, the first national household survey on the justice gap in the United States in over 20 years. LSC contracted with NORC at the University of Chicago to conduct a survey of approximately 2,000 adults living in households at or below 125% of the Federal Poverty Level (FPL) using its nationally representative, probability-based AmeriSpeak® Panel. The 2017 Justice Gap Measurement Survey report presents detailed findings from the national household survey exploring the justice gap conducted by NORC at the University of Chicago using its nationally representative, probability-based AmeriSpeak® Panel. Click here to view the Justice Gap Measurement Survey report. 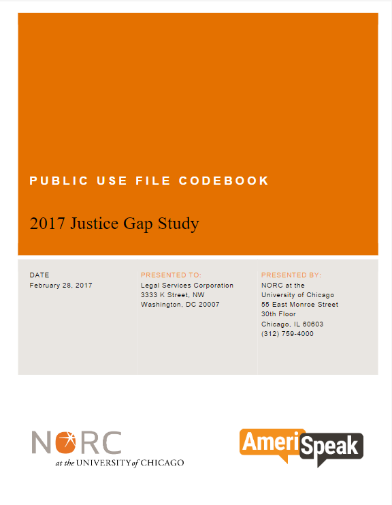 The programmed survey instrument, codebook, and data files from the 2017 Justice Gap Measurement Survey conducted by NORC at the University of Chicago are available for download. Click here to view the survey instrument, codebook, and data files.